I’ve been looking for a new mascara for a while. I’m very difficult to please in this category. I’m not sure why: my lashes are already fairly long and dark, so I don’t need a product that claims to make them look ONE THOUSAND TIMES thicker or one that gives the effect of false lashes. (Why would I want to wear false lashes, or have anyone think that I am, anyway? I’m not a burlesque performer.) I don’t have easily irritated eyes or any need for a waterproof formula, either. I just want to add a little extra length and definition. It shouldn’t be a tall order. And yet, and yet…nearly every mascara that I try causes some sort of minor problem. It makes my eyes feel vaguely itchy. Or it transfers from the brush to my lashes in a myriad of sticky little clumps. Or, despite that initially gluey application, it later turns dry and flaky, drifting from my eyelashes like tiny bits of ash. This situation includes products from department-store brands as well as certain high-end lines. I will not name names. 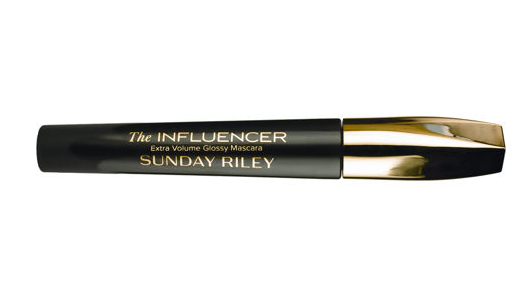 About a month ago, I received a complimentary tube of Sunday Riley’s The Influencer Extra Volume Glossy Mascara. (Sunday Riley has become known for its natural skincare over the past couple of years and just recently added color cosmetics to its offerings.) I figured I’d give this new product a chance, since I’d recently thrown out a partially-used tube or two of drugstore mascara that had (once again) let me down. So I tried The Influencer one morning, and I was surprised in the most pleasant way. This mascara applies smoothly and precisely with an old-fashioned brush (none of those little plastic nubs!) that feels nicely flexible yet firm. It doesn’t clump. It doesn’t flake. I’m not constantly thinking, “Oh, yes, I am wearing mascara,” as I feel my lashes sticking to one another and shedding bits of pigment every time I blink. It enhances my eyes without attracting undue attention to itself. 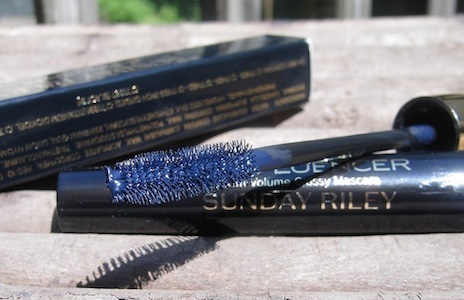 Sunday Riley’s mascara is offered in three shades. I’ve been wearing Midnight Sapphire, which looks almost cobalt blue in the tube but applies as a cool, dark greyish-blue. It’s definitely not the electric blue mascara that we or some of our friends might have worn with acid-wash jeans and feathered hair in the mid-1980s, thank goodness. It’s subtle and flattering and modern. And the brown shade, Truffle, is even better (and is on my list of eventual purchases). If you already own a roster of mascaras in various formulas, at various price points, that work for you and your eyes, then you may not need another. However, if you share my usual frustration with this particular product category, you may wish to visit a Sunday Riley counter and ask to try The Influencer. 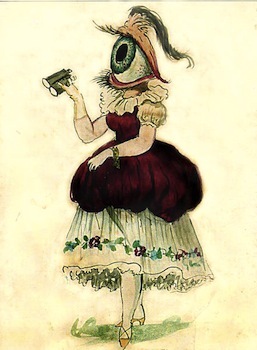 Images: “Female Eye” costume design from Krewe of Comus, New Orleans Mardi Gras 1969, via Wikimedia Commons; close-up product photo by the author. Disclaimer: I received this item as a press sample from Sunday Riley and Bergdorf Goodman.